William Shakespeare was born 450 years ago today (April 23, 1564) and his plays and poetry still grip us. He often got his plays going with a bang, setting the scene dramatically and establishing the main themes of the play. Picture the beginning of King Lear. Lear has decided to split his kingdom between his three daughters. Aware of the multiple dramatic opportunites afforded by issues concerning wills and inheritances, we settle down for a juicy family row, a bit of inter-sibling mudslinging, perhaps, or the airing of a few daddy issues. Oh, we don’t know the half of it. First, Lear decides to announce who’s got what in a public show at his court. Then he demands that each of his daughters should tell him how much she loves him. The one who loves him most will get the most. You’re probably thinking that this can only end badly. How right you are. Daughters One and Two go for it big time, trying to outdo each other with their ludicrous, extravagant declarations. Lear laps it up. This is what he wants to hear. But the best, he thinks, is to come. His youngest daughter, Cordelia, who is also his favourite, is called on to speak. What can you say, he asks her, practically purring with anticipation, to get even more land than your sisters? The bombshell drops. ‘Nothing,’ she says, and boy, does she stick to it. She tells Lear she loves him as her father, according to her bond with him. She cannot find flowery words to express her feelings. And in any case, how can she or her sisters truthfully say they love their father more than anyone or anything else? That’s just plain stupid. Does this stance win Cordelia her share of the loot? What do you think? This dramatic scene touches many aspects of the way we communicate. The first thing we might notice is it takes place in public, in front of family members, employees, friends. People’s egos are on show. Their greed is exposed. Their neediness is obvious. The impact of the flattery and of the refusal to flatter would be far less if the conversation were conducted in private or in writing. There are some conversations and some comments which really should not be open to public scrutiny. If you feel the need to criticise someone’s work or behaviour in front of others, you could stop and ask yourself what is gained by having an audience. If it is to make you look good, you could think again. If it is to humiliate the other person, ditto. In the same way, if you are tempted to add your piece to a juicy bit of gossip or character defamation, consider the context before you speak. Is this an audience you identify with? Do you trust them to take your contribution in the spirit in which it was meant? Are you happy about them passing it further on down the line? If the answer is no, you might choose to share your observation in a less exposed place. 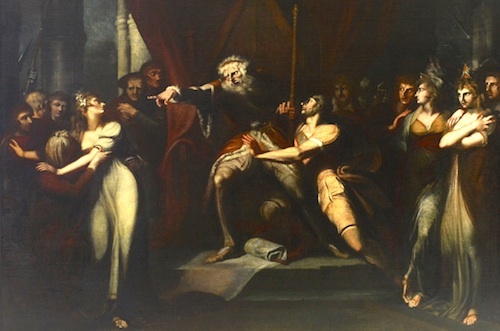 In the play, King Lear values empty words above true feelings. Although Cordelia’s ‘nothing’ is bit sharp (OK, more than a bit), the bond she refers to is the binding love between a parent and a child – a bond which she honours too much to express in the equivalent of Hallmark Card sentiments. She won’t lay a bouquet of flowery language at the shrine of Lear’s vanity. When we automatically and frequently use words such as ‘love’ and ‘amazing’ and ‘out of this world’, we debase their value and we lose personal authenticity. Shakespeare’s language is tough, flexible and pliant. It has the power to enchant, amuse, engage, enrage. It can move us to tears and make us shiver with delight. Let’s mark his 450th anniversary by honouring words and choosing to use expressions which communicate our feelings with accuracy and grace.